This is a guest post from Elle Pacholoski, founder of Get Outdoors from the Xcelerate cohort. 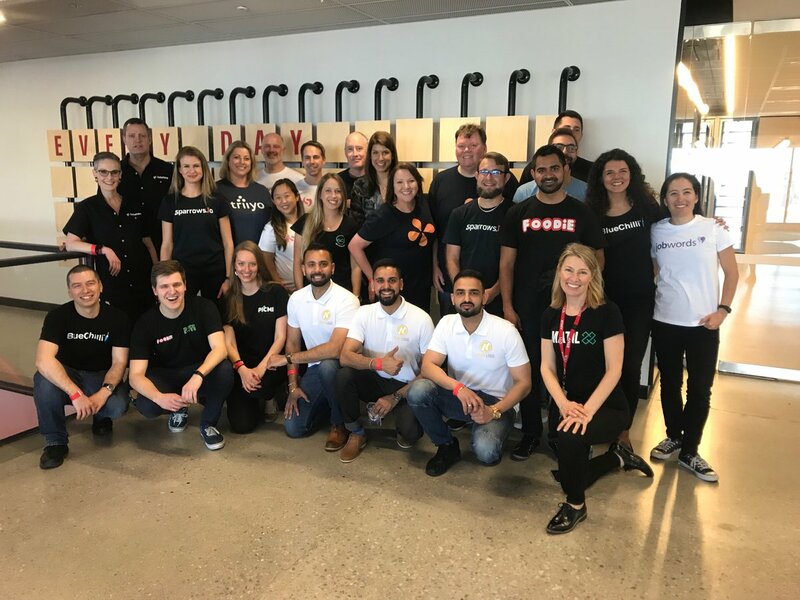 Here Elle shares her experience of the Expo where the Xcelerate cohort shared what they have created in just 12 short weeks – the halfway point of the six month accelerator program. The Xcelerate cohort has been thinking and planning Expo Day since we entered the Xcelerate program on June 26. The Expo was our first milestone in the accelerator program; an opportunity to showcase to key interested parties all that we had been working on these last 12 weeks. To say it was an important day would be an understatement. Some say that Expo Day is a blip on the journey of our startup, which I’m sure it will become one day, but for the past 12 weeks, it was the mountain we had to climb, learning to mountaineer along the way and absorbing as much advice as we could to propel there faster. We were preparing our 30 second pitches, our 2.7m square spaces, collecting supplies to make our solution to a problem look like ‘real businesses’, building slides, videos and websites, thinking about how to grab people’s eye with a creative zone, or even chocolates. And that was just preparation for the one day. Xcelerate startup founders mindful moment before the Expo starts. What did it take to get us here? It was a surprise that on the day our main concern didn’t end up being how developed our products were – nobody seemed to even look at the video I’d made of our GObot doing it’s magic. It turned out what mattered was WHY our business does what it does, and what results we’ve achieved in proving it’s value. It was about mixing the hours of research and development, testing and conversations into one to prove all that we’d done was done for a purpose. 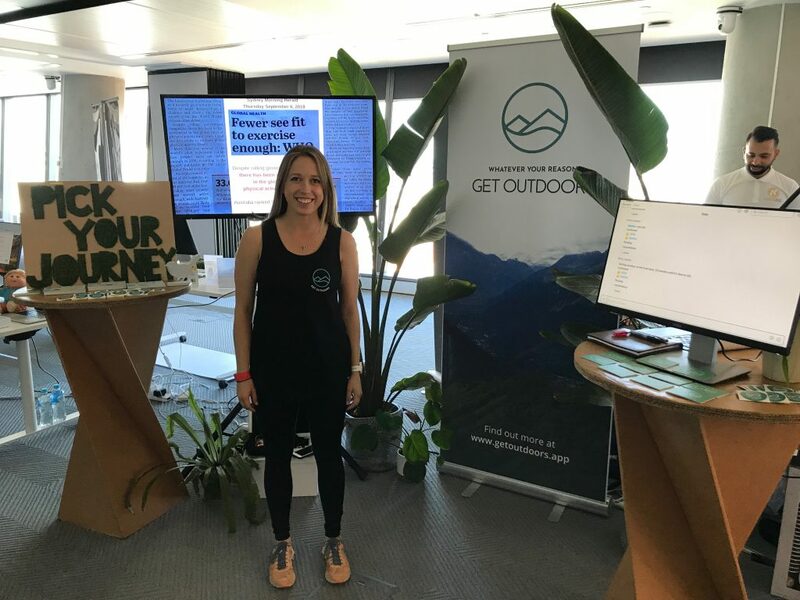 Here’s Elle at the Expo in front of her stand for her startup, GetOutdoors. It was emotional dealing with all the feelings after the Expo. Like I imagine it would be reaching the summit of Mount Everest after months of training day-in and day-out. There are so many new conversations to be had and so many ideas to pursue which could only come from a very public, open forum where anyone could come poke and prod at your business. Everyone was overjoyed by the incredible response we’d had from attendees. I think it was always going to feel “too-soon” for us founders. Recalling our very first immersion with Xcelerate advisor Phil Hayes-St Clair, he told us all to “think publicly” at all times when building your startup. The idea being that you should as often as possible have your product in front of customers because it means you’re always getting feedback, and keeping the customer at the core of your business. None of this squirrelling away at your business and releasing it to the world, only to find that no-one wants it! So we thought publicly, showing it off to hundreds of people in just 12 weeks. As startups, with the customer at our core and their needs constantly changing, I’m not sure we’ll ever reach perfection, but we will keep progressing – at an xcelerated pace. It was a great reminder that the journey is about progression, not perfection. Xcelerate founders with the BlueChilli & CCA team. Elle is a part of the Amatil Xcelerate cohort which are over halfway through their 6 month accelerator program with BlueChilli. 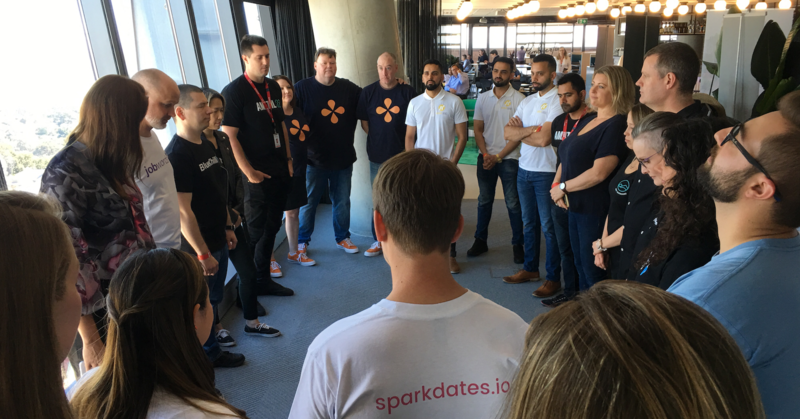 Applications are open for the Stockland Accelerator. We’re looking for PropTech solutions to big problems and applications close Monday the 22nd of October.